ituated overlooking The Regent’s Park, this exquisite Grade I listed Nash townhouse has it all. From floor to ceiling windows and grand fireplaces, to sublime architectural details, the natural beauty of this Regency gem is breath-taking. 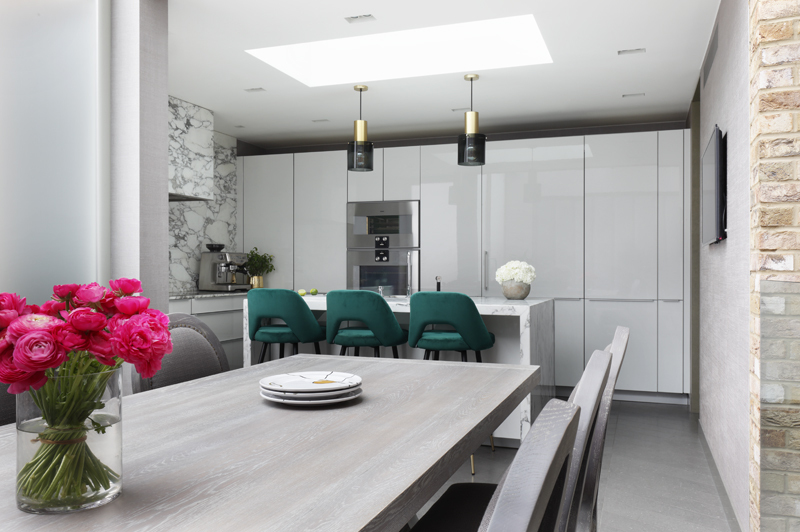 Set over six stunning floors, we designed this family home for lovely long-standing clients who had just become new parents, so the brief was very different to any that had come before it! 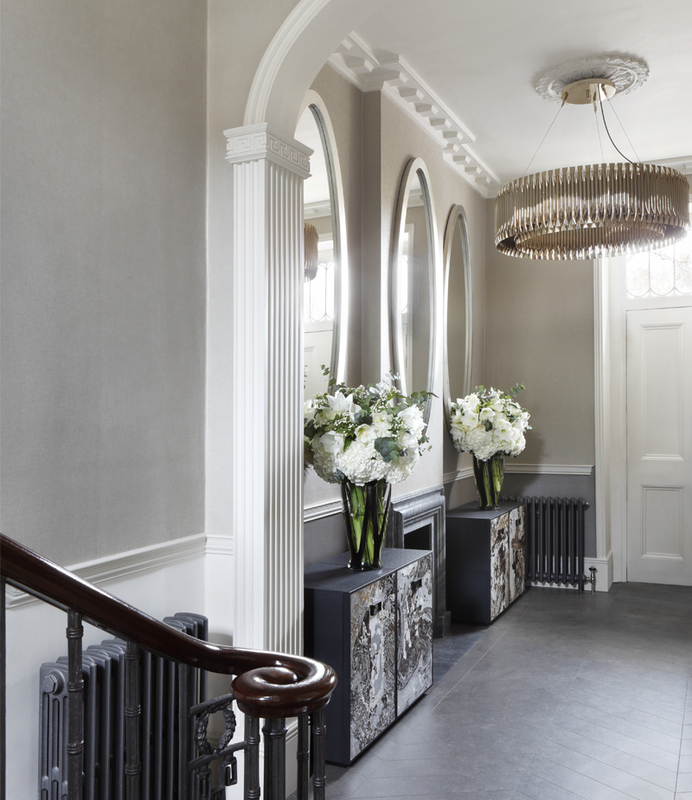 Responsible for the architectural interior design, we were commissioned to breathe new life into the splendid proportions of this legacy home, creating a contemporary family space, whilst respecting the building’s illustrious history. 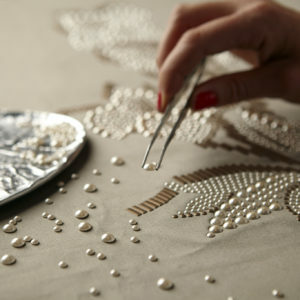 We set to work creating a luxury residence that meets the demands of a sophisticated, yet down to earth young family. 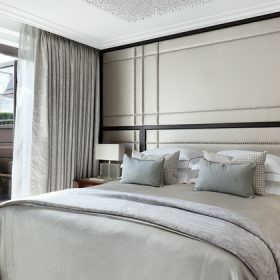 Behind the elegant façade lies a timelessly neutral palette, punctuated by pops of colour throughout, where shades of blue and green coalesce with mixed metallics and muted hues of grey, champagne and mink, inspired by the classical setting. 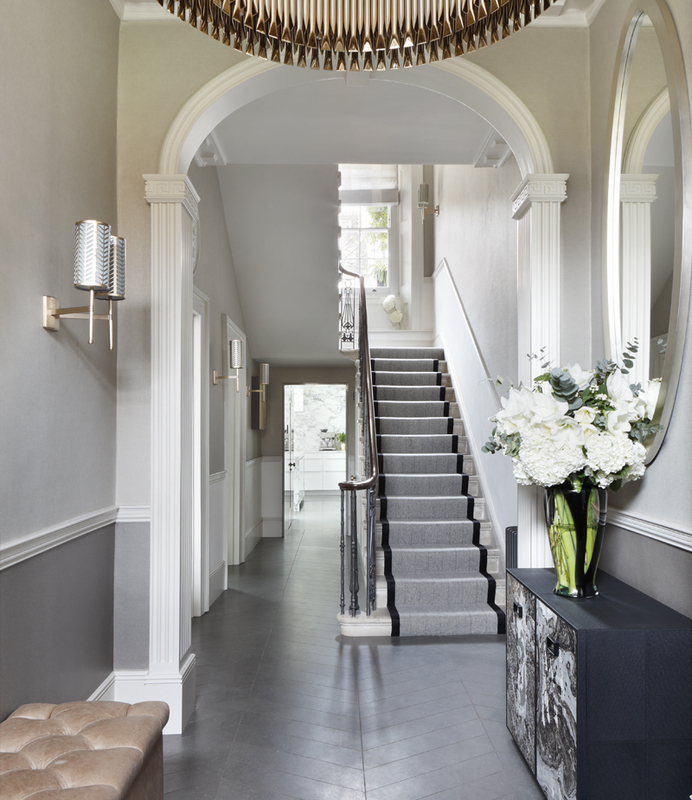 Illuminated by the sleek brass statement chandelier, the entrance hall features three oval mirrors that reflect the light beautifully and lead the way through to the informal reception rooms. 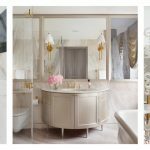 A key element of the brief was to create areas for both informal and formal entertaining. The ground and lower ground floors are dedicated to informal, family living, with a reception room, study, kitchen, wine cellar, media room and gym. The informal reception room is the heart of the home. An oversized sumptuous sofa that you sink into sits on top of a striking silk geometric carpet by Stark, lit by a statement brass pendant. This space marries the practical requirements of family living (like hidden toy storage) with striking design details and stunning works of art. 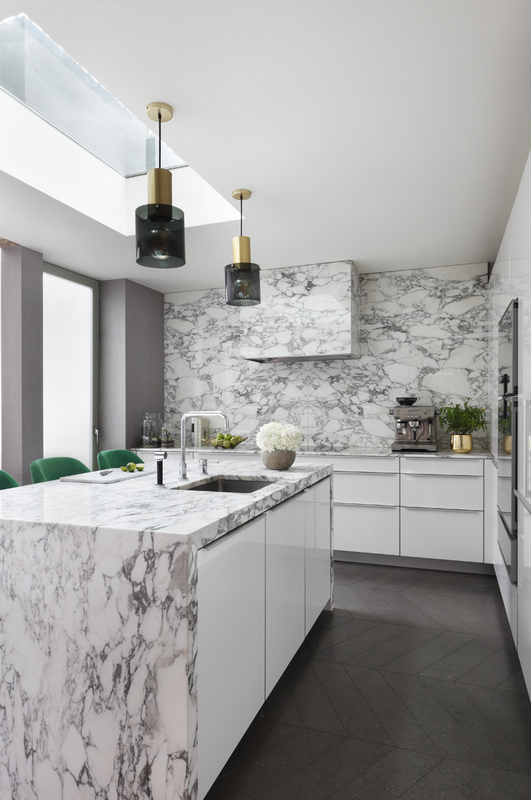 Elegant herringbone-laid floors continue from the entrance hall into the striking contemporary kitchen, where the natural beauty of marble contrasts with expanses of glass and exposed brickwork. A large farmhouse style table creates a relaxed family vibe. 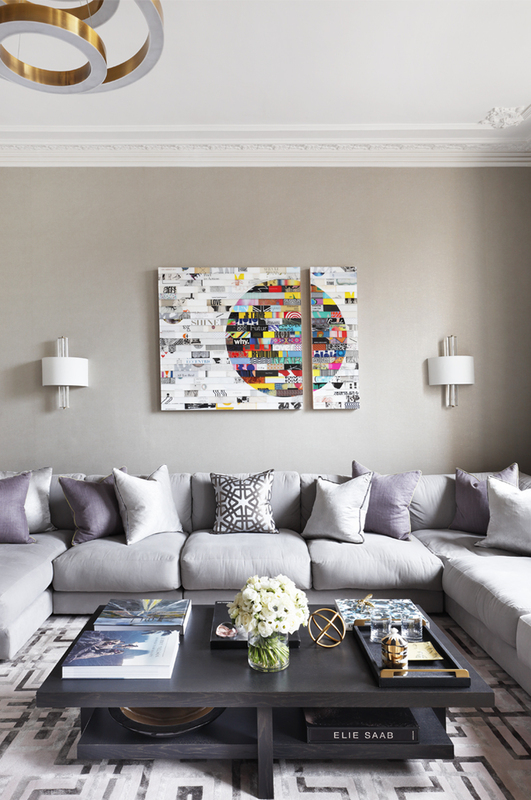 One of the most interesting parts of the brief was to not only showcase our client’s extensive art collection within the design, but also to source and thoughtfully curate new works of art to complement their existing collection. The media room features David Yarrow’s Crazy Horse, a new piece that adds value to the space and sets the tone for what lies within. 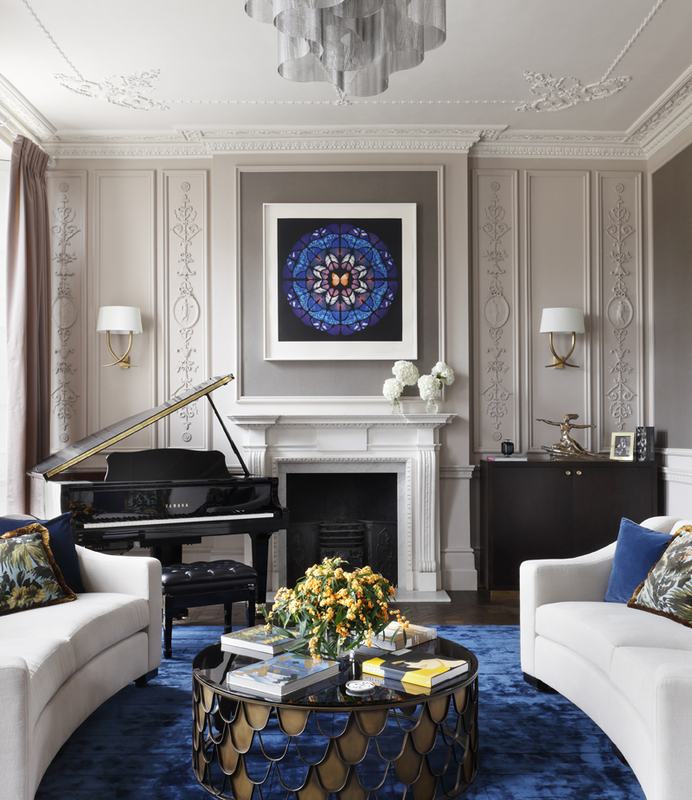 The dramatic sweep of the staircase leads up to the piano nobile – the principle entertaining floor – which is exclusively dedicated to the formal drawing room and dining room. The full-height sash windows bring the outside in, creating dramatic proportions and a grand sense of scale. 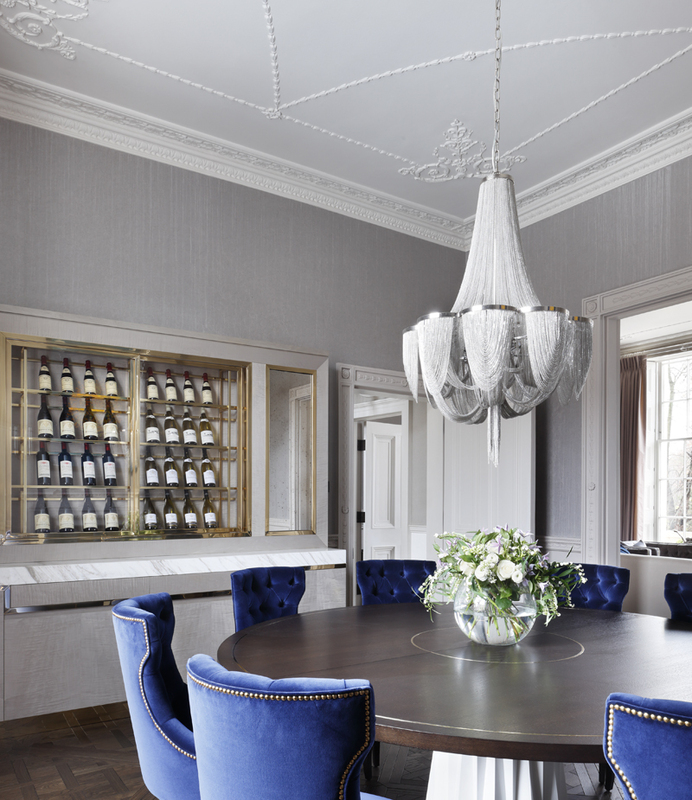 A baby grand piano sits atop the painstakingly crafted Versailles parquet floor with interlaced diagonals, whilst a shimmering low-hanging chandelier made up of hundreds of lengths of interlacing metal chain illuminates the bespoke circular dining table below. A bespoke sycamore wine display with brass and marble details creates a grand gesture. 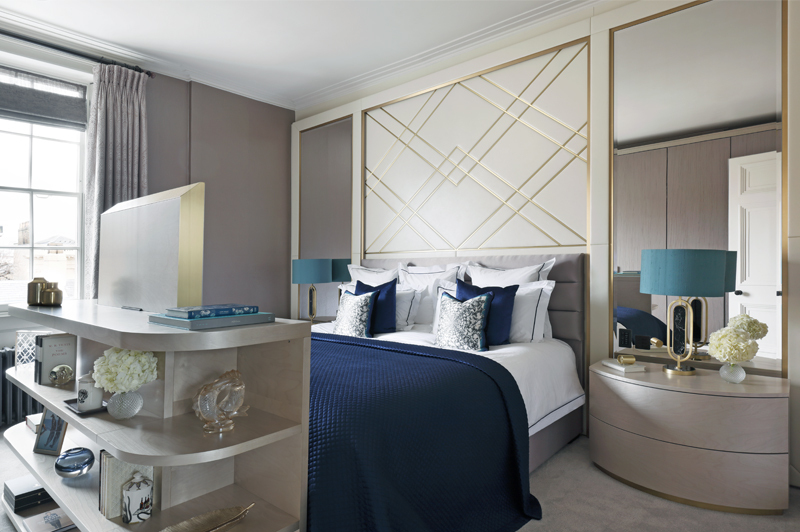 A further curve of the Portland stone staircase flows seamlessly into the master suite, made up of a show-stopping dressing room, complete with a double-ended dressing island and vanity, bathroom and master bedroom with a full-height bespoke geometric leather and brass panelled headboard as the pièce de résistance. Gracefully sweeping upwards, the penultimate floor makes way for the calming nursery, jungle-inspired playroom and guest bedrooms. 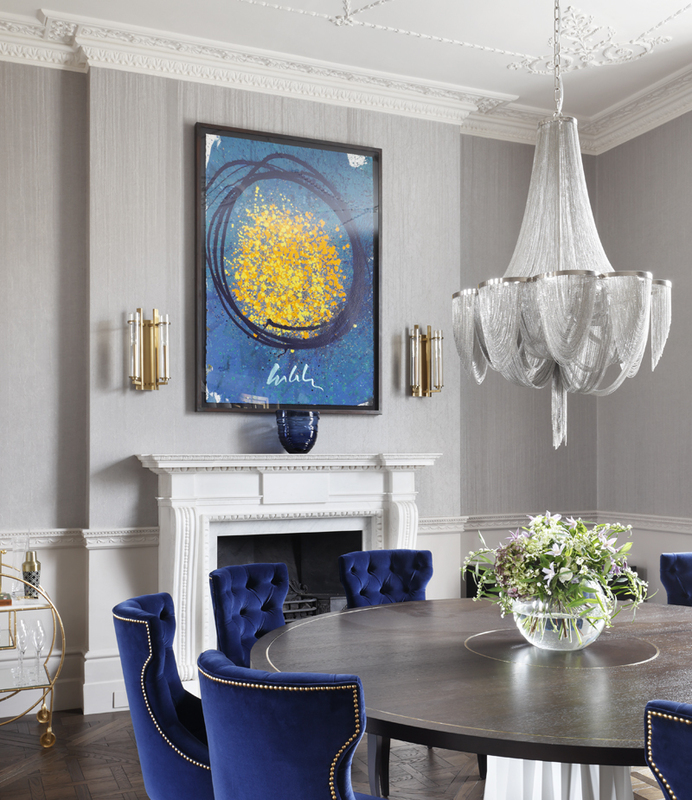 Impressive high ceilings and intricate period details create the picture-perfect setting for high-impact statements throughout; from stunning works of art to bespoke furniture pieces and contemporary lighting, pure luxury is at the heart of this Regency family residence. 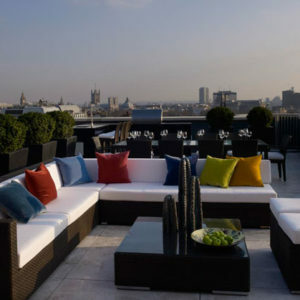 What Makes a Prestigious Super-Prime Penthouse? Be the first to hear about our super-prime projects.